The Nigerian Senate President, Sen. Bukola Saraki is in the news again. This time, it is not on the normal Senate business as usual. Rather, he is facing a serious criminal count charge of forgery with his deputy, Sen. Ike Ekweremadu. His appearance in the court yesterday bothering on the allegations of forgery has made him cry out. 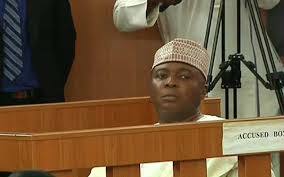 The press quoted Saraki saying; “.....today we the leaders of the Nigerian Senate reiterate our innocence against the charges filed by the Attorney General of the Federal Government of Nigeria at the Federal Capital Territory (FCT) High Court on the allegations of forgery of the Senate Standing Rules document. ''In the words of Martin Luther King Junior, “the ultimate measure of a man is not where he stands in moments of comfort and convenience, but where he stands at a time of challenge and controversy”. ''This is a cross I am prepared to carry. If yielding to the nefarious agenda of a few individuals who are bent on undermining our democracy and destabilising the Federal government to satisfy their selfish interests is the alternative to losing my personal freedom, let the doors of jails be thrown open and I shall be a happy guest." Saraki's lamentations in his statements call for questioning. While peaceful Biafrans are being persecuted on daily basis, this man and his cohorts continued to overlook the injustices meted on Biafrans because they are not affected but now are all crying wolves as they are being giving the same treatment as Biafrans. Has Saraki seen that he is not above the natural laws of causes and effects? Has he also seen that the injustices he neglected to speak against as a legislative leader are now hunting him? It is too early for Saraki to start lamenting about political persecution and jail because the latter is where he is surely jail bound. I never knew Saraki could remember the words of Martin Luther King Jr. Why didn't he remember these while an innocent leader of the Indigenous People of Biafra (IPOB); Nnamdi Kanu is being persecuted and oppressed for no just reason? Is there a need for lamenting for being taken to the court? Is he now feeling the pains of injustice and oppression meted on innocent Biafrans? Saraki should feel it the more with his cohorts. The Senate President should learn from his current predicament that truth is life and standing on the path of truth even at death's point is more honourable. The only remedy to his predicaments is to amend his ways and save himself from further embarrassments by turning back to support and speak the truth about Biafra. This is a clarion call to other Senators that what has befallen their leaders will certainly get to them very soon within the shortest period of time as they have all jointly neglected and trampled upon truth and justice. Materialism is much more valued than human lives by these bunch of individuals and the natural laws of causes and effects will not rest to take its course on the defaulters whether they are learned or ignorant.